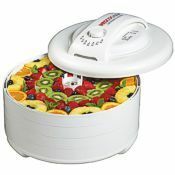 A food dehydrator is a great addition to any kitchen, letting you preserve delicious natural foods including fruits, vegetables, and meats. Why spend money on costly products loaded with questionable ingredients, when you can enjoy your own quality snacks that are both healthful and great-tasting? At Pleasant Hill Grain, we only carry top-of-the-line, high quality products that provide real value. 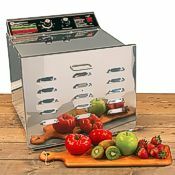 Below we’ve outlined some of the best food dehydrators on the market from Nesco and Excalibur. 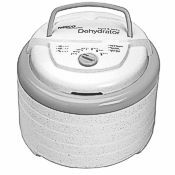 Depending on your needs, we also carry other food dehydrators and accessories that all measure up to our quality standards. Have questions about these model or others in terms of which is best for you? Give us a call and talk to our friendly, experienced customer service staff! 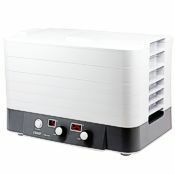 One product that we recommend to many customers looking to purchase their first dehydrator is the Nesco FD-1040 Digital Dehydrator. 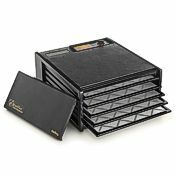 This model comes with 4 trays, each providing 1 sq. ft. of surface area to place food, but it can expand to 20 trays. 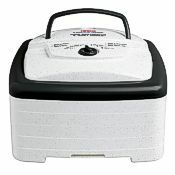 Its power lets you dry food in hours (instead of days), but still provides quiet operation. 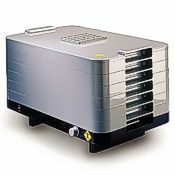 The air pressure adjusts automatically to the number of trays used, and the temperature is adjustable between 95° and 160° F.
As a top-motor food dehydrator, the FD-1040 is ideal for drying wetter foods, as it prevents liquids from dripping on the motor or heater. This design also makes cleanup extra easy! The patented Converga-Flow™ design from Nesco provides fresh air equally to every tray and eliminates flavor sharing or the need for tray rotation. The Nesco FD-1018A dehydrator is the manufacturer’s most powerful model! 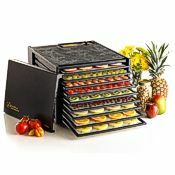 It comes with 8 trays, each providing 1 sq. ft. of drying area, and is expandable up to 30 trays. That means up to 30 square feet of food drying area! 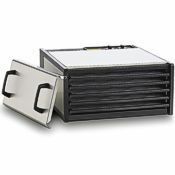 Similar to the FD-1040, this model lets you dry food in hours and provides uniform drying air to all trays without flavor sharing. 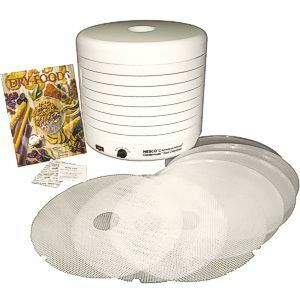 Because of its expandability, this is one of our most popular dehydrator models among people who use their dehydrators often. For this model, and the one above, food contact parts are dishwasher safe and completely BPA-free. Both come with a 52-page recipe and instruction book. 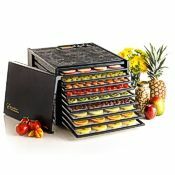 For our most avid food dehydrating customers, we recommend the Excalibur D900 9-Tray Dehydrator. 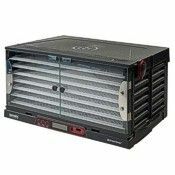 It features an exceptionally solid stainless steel case and tray construction, with Excalibur’s patented Parallexx™ airflow system that moves fresh air from the back to the front of the dehydrator so each tray receives its own supply of fresh, dry air. 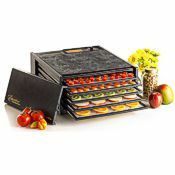 This exclusive Excalibur dehydrator design prevents flavor sharing and produces uniform drying without time-consuming tray rotation. 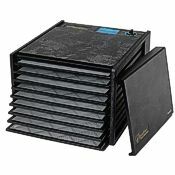 The Excalibur D900 comes with 9 large drying trays but can operate with any number of trays (or even no trays at all—allowing you to use it as a low-temperature oven or to dry damp boots and mittens!). 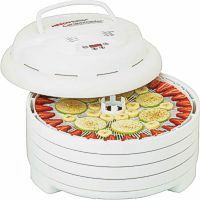 The timer on this model can be set to operate your Excalibur dehydrator from one hour up to twenty six hours and will turn it off at the end of the time period that you've selected. This makes it easy to incorporate dehydrating activities around your schedule. Your Excalibur will turn itself off while you're sleeping or when you are away. 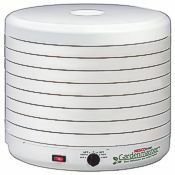 The timer makes dehydrating as convenient as using a slow cooker for unattended meal preparation. 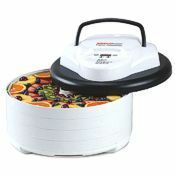 As with the other models mentioned, food contact parts of the Excalibur dehydrator are dishwasher safe. Customers will also receive both the 192-page Preserve It Naturally book (a $24.95 value) and the 32-page Excalibur Dehydration Guide at no additional charge. To top it off, the Excalibur D900 comes with an impressive ten year warranty. 4-20 sq. ft. 8-30 sq. ft 12.4 sq. ft. 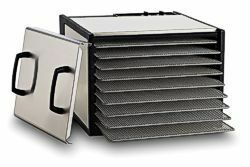 Pleasant Hill Grain provides a superior online shopping experience for home and kitchen products, including our excellent selection of food dehydrators. 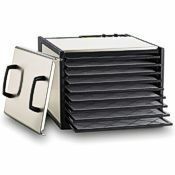 We’re a factory authorized dealer for every dehydrator we offer and carry a wide selection of accessories, appliances, and cook’s tools. 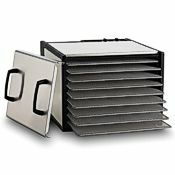 We offer free shipping on all dehydrators, and most items are stocked in our own facility for fast and reliable shipping to you. Have questions? Please call us at the number below—we’d love to help you select the food dehydrator that’s perfect for your needs! 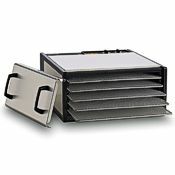 86 - 165°F Rectangular 15.9 sq. ft. 15.9 sq. ft. 4" — Plastic or stainless steel 750 1 yr.
95° - 160° F Round 3.6 sq. ft. 11 sq. ft. 4.6" — Plastic 600 1 yr.
95° - 160° F Round 3.9 sq. ft. 11.8 sq. ft. 3.6" — Plastic 500 1 yr.
95° - 160° F Round 4 sq. ft. 20 sq. ft. 4.5" 48 hrs. Plastic 1000 1 yr.
95° - 160° F Round 5.2 sq. ft. 15.6 sq. ft. 3.6" 24 hrs. Plastic 600 1 yr.
95° - 155° F Square 5.4 sq. ft. 11 sq. ft. 4.6" — Plastic 700 1 yr.
105° - 165° F Square 5.9 sq. ft. 5.9 sq. ft. 5" — Plastic 440 10 yrs. 105° - 165° F Square 6.8 sq. ft. 6.8 sq. ft. 5" 26 hrs. Plastic 440 5 yrs. 105° - 165° F Rectangular 6.8 sq. ft. 6.8 sq. ft. 5" 26 hrs. Plastic 440 10 yrs. 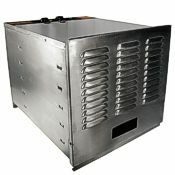 105° - 165° F Rectangular 6.8 sq. ft. 6.8 sq. ft. 5" 26 hrs. Stainless steel 440 10 yrs. 95° - 158° F Rectangular 7.2 sq. ft. 24 sq. ft. 4.5" — Plastic 530 10 yrs. 95° - 158° F Rectangular 7.2 sq. ft. 24 sq. ft. 4.5" 24 hrs. Plastic 530 10 yrs. 95° - 150° F Round 8 sq. ft. 30 sq. ft. 4.5" — Plastic 1000 1 yr.
105° - 165° F Square 12.4 sq. ft. 12.4 sq. ft. 7" — Plastic 600 5 yrs. 105° - 165° F Square 12.4 sq. ft. 12.4 sq. ft. 7" — Plastic 600 10 yrs. 105° - 165° F Square 12.4 sq. ft. 12.4 sq. ft. 7" 26 hrs. Plastic 600 10 yrs. 105° - 165° F Square 12.4 sq. ft. 12.4 sq. ft. 7" 26 hrs. Stainless steel 600 10 yrs. 95° - 155° F Rectangular 15.5 sq. ft. 15.5 sq. ft. 7" 10 hrs. Chrome or stainless steel 1000 1 yr.
90°F - 155° F Square 16 sq. ft. 16 sq. ft. 6.75" 12 hrs. Stainless steel 800 1 yr.